The number of people killed the Istanbul’s Ataturk airport attack has risen to 41 with 239 injured, the Turkish city’s governor says. Thirteen of those killed in the attack were foreign nationals, he added. Three attackers arrived in a taxi and began firing at the terminal entrance late on June 28. They blew themselves up after police fired back. Turkish PM Binali Yildirim said early signs pointed to ISIS. However, no-one has so far admitted carrying out the attack. Turkey has declared June 29 a day of national mourning. 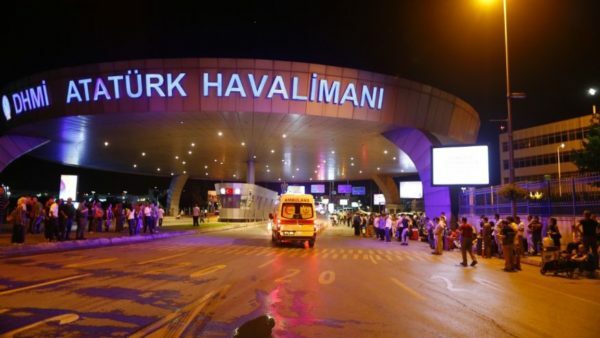 Turkish investigators are examining CCTV footage, witness statements and mobile phone video recorded by terrified passengers to try to determine the identity of the attackers. According to the Dogan news agency, autopsies on the three dead men suggested they may be foreign nationals but this has not been confirmed. Turkish Health Minister Recep Akdag says that 128 people remain in hospital, including nationals of Saudi Arabia, Afghanistan, Pakistan, Uzbekistan, Ukraine and Switzerland, the Associated Press reports. Of those, 41 are still in intensive care. Heavily-armed security personnel were patrolling the airport. Flights had resumed in the early morning, though with many cancellations and delays. Turkey’s President Recep Tayyip Erdogan said the attack should serve as a turning point in the global fight against militant groups. Reports of the attack vary but it appears the attackers opened fire at the entrance where X-ray machines are positioned, sparking an exchange with police. At least two of the attackers ran into the building. Footage on social media shows one moving through the building as people around him flee. He is shot by police and remains on the ground for about 20 seconds before blowing himself up. All three attackers were killed. Russian President Vladimir Putin offered his condolences to Turkey in a phone call with President Erdogan, as the pair seek to rebuild ties. France’s President Francois Hollande has confirmed two French nationals were injured in the attack, but not seriously. #PrayforTurkey began trending on Twitter after the attack on Istanbul international airport.